It would be easy to say ‘The 400cc Scrambler is the most important model released in the first half of 2016, any size from anywhere! So there. 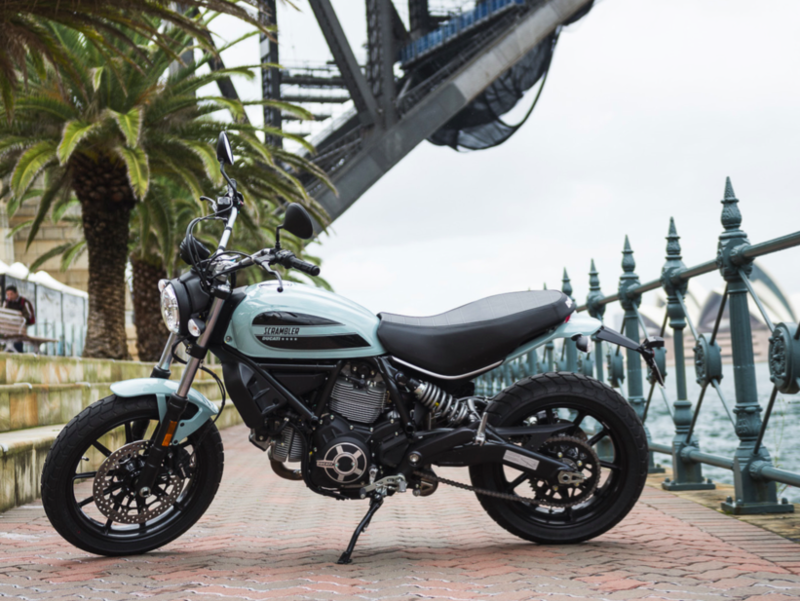 Unless, hang in there please, others are with you, not everyone will think the new Ducati LAMs version Scrambler is the most important new motorcycle to be released this year. Although, for a rather huge audience and the ones that matter, we are talking about Gen Z here, just ask them they do matter, the littlest Scrambler is much anticipated. 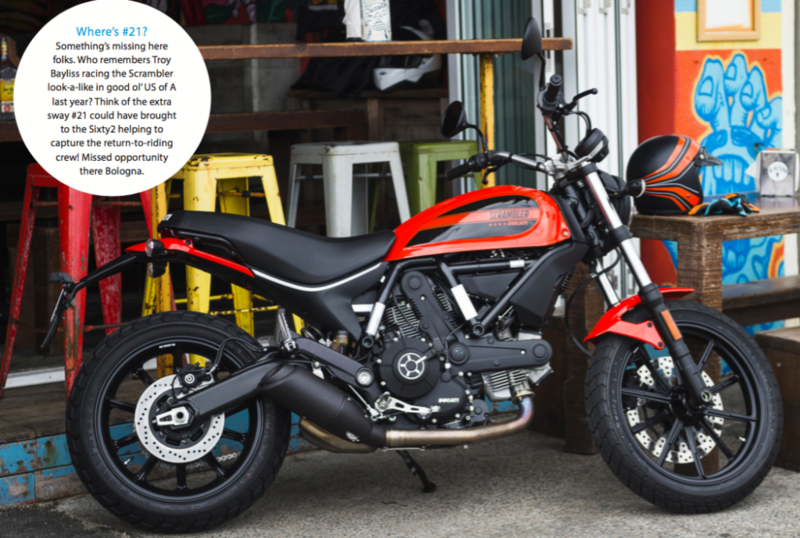 Most newbies will not even register the breadth of new models cascading onto the market for 2016 including Ducati’s Multistrada Enduro, Triumph’s Thruxton R or KTM’s GT1290. Those models can’t be on your radar if you about to going shopping for your first steed. To you, clapping your fervent hands, the above introductory quote should just about hand it on a plate if you are asking for advice or even money to be served up. That should also take care of the few hundred Learners graduating from rider training schools every week too, looking for an ultimate fit a first-timer. 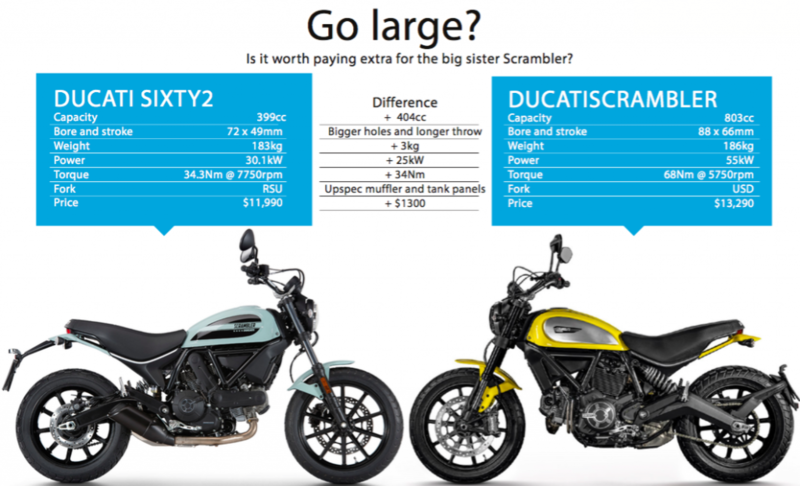 Now to reality, of course a sleeved and bored down L-twin from the Scrambler 800 isn’t really a watershed model in Ducati’s fold but it does bring an end to hype and dealers must be rubbing their collective hands for a model which will bring a steady stream of new interest into showrooms. It has been well-PR spun and a much desired learner-legal motorcycle is ready to slip into their range. 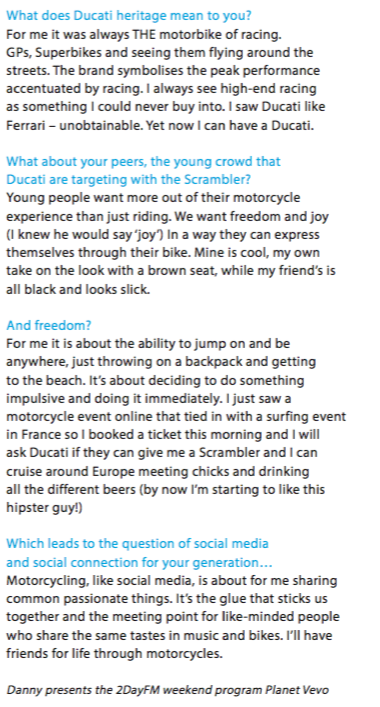 Ducati have targeted a large slice of their marketing on a fun, young crowd tagging on the ‘Land of Joy’ ‘Born Free’ ‘New Pop Icon’ in a hashtag- fest for Gen Z. Calling Ducati’s new LAMS version a Sixty2-as in 1962-plays into the nostalgia of flower-power, sweet innocence of California Dreaming and a nod to the first Scrambler. In a way the ride and feel does tap into simple, lazy summer days with the naked, lean looking retro lines and BMX like build. The sweet generation couldn’t have a more tantalizing choice with a Sixty2 Ducati. Something’s missing here folks. 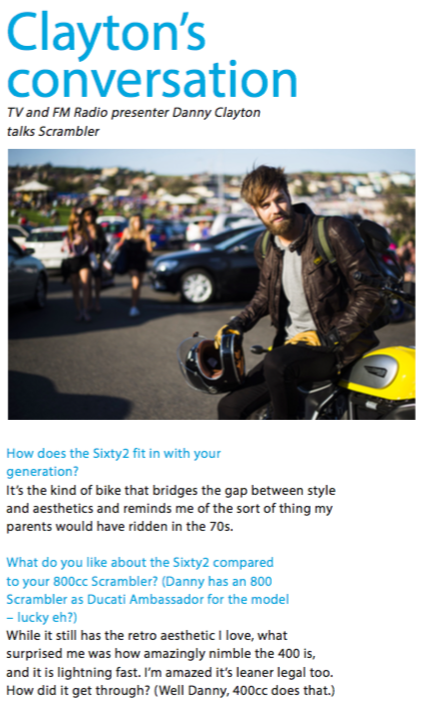 It’s a pity because the Sixty2 model has ‘holding on to your youth’ built into its punchy little soul. Without Troy Baylsis. Who remembers #21 racing the Scrambler look-a-like in good ol’ US of A last year and flying the flag for over-forty- somethings would have been consigned to the marketing heap. Think of the extra sway #21 could have brought to the Sixty2 helping to capture the return-to-riding crew? Missed opportunity there Bologna. Or maybe we should go straight to the full-house 800 version! Still don’t all of us need ‘Be Free” inscribed on the filter cap, not just showing the level of detail the Italians will go to capture the label conscious generation and maybe tapping into the mortgage and miserable older types too? This launch wasn’t on fashion-streets of Milan or the new flat-track circuit at Appin but a quick fun-filled adventure belting through inner west of Sydney to Luna Park and a squirt to Bondi and if that was a representation of normal service then the only thing missing was an L plate attached under the rear number plate. Short, sweet and poignant. Desmo. Does that ring a bell? Desmodromic valve system mightn’t mean all that much to the uninitiated but it means a great deal to the savvier amongst us, right? To have the same valve actuating system (by name at least) on your learner approved top-end and bragging that Maniac Joe has a not-so-near-identical system operating at 354.9kp/h down the straights of Mugello on his MotoGP GP16 Ducati. How cool is that? While the Sixty2 isn’t reaching stratospheric heights of 15,000rpm, the four valves in total will always get a decent workout as the littlest Ducati has to extracts every single kilowatt of its 30.1kW’s required to keep well ahead of traffic and keep you smiling. Acceleration is spritely, surprisingly to the point of you forget it is only 399cc’s. Revs build in a very linear fashion right off idle, with just the right amount of fun-urge lasting right through the range and there is a minor kick a couple of thousand revs up to the 10,000rpm redline. With an over-square 72mm bore 49mm stroke there is a guarantee the L twin has capacity to rev hard. This is an engine practically designed to be a very natural kind of learner-style power plants going, where it is a flexible tool first, forgiving the wrong gear for the wrong revs scenario. Even the gear ratios are well spaced as the spread between the gears isn’t too close which allows each gear to be flexible with a reasonable amount of torque to help cope with a subsequent drop between each ratio. It is a good teacher too, as the you are still learning the art of throttle control the Ducati is forgiving to jerky indecisive inputs. Defining gear isn’t confusing as there is the right ratio for every need. First to get going, and second for strong acceleration and third and fourth for building of road speed. Fifth and sixth are good highway and freeway tall as they are. Tall as in it feels like an old fashion overdrive yet at an indicated 106 kp/h (the stupid, redundantly located tacho at the bottom of the dial where I would have hoped it was sweeping across the top of the single pod instrument) is nudging 6000rpm digitally speaking. Newbies will get the concept of the right gear for the appropriate corner while the more experienced riders will enjoy ringing the neck out of third or fourth between corners. Fun and bankable stuff to put into the memory cells too. Ducati didn’t have to stray too far in the styling department to push this and tuck that making some obvious distinctions between the bigger Scrambler and the Sixty2. From the front-end you can see the adaption of the right-side-up front forks measuring up at a wholesome 41mm. No complaints here as the ride and steering are matched well giving the ’62 a comfortable yet sporty ride. 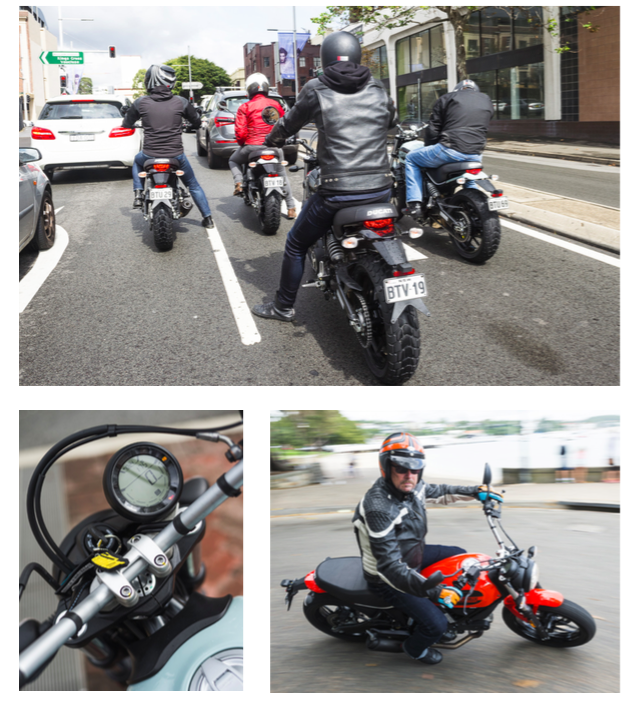 The monoshock rear combines well in tandem with the swept seat to help iron out the Sydney pot-holed abomination of roads. Initially the suspension gives the impression of softly sprung with little dampening. This may appeal to the Flat-Tracker image needing all of the 150mm of travel but then if you start pushing the littlest Ducati the family trait is evident. The next part of the travel is firm and the 400 starts enjoying smoother faster bends. Sticking with a nowadays unfashionable 18inch front and an 17inch rear tyres helps with stability and ride. The swingingarm is a lower spec’ than the 803cc big brother and the exhaust muffler is similar but different in a keeping the family together way. Altogether it is a very engaging ride as you feel immediately in charge and in control with lightness and narrow size. The ultra-wide bars and the skinny proportions and the low 790mm off the ground seat add to the control. My safety conscious parental brain kicks in here and I believe the Scrambler is a better learners bike than any of the sporties which offer only marginally better performance and the loss of vision in traffic because of a set of low ‘bars or clip-ons. There is virtually nothing to take away your concentration as the engine is smooth and almost pulse-free compared to the larger Ducati’s. I did throw a leg over for a quickie on one of the test bikes that had the Termignoni fitted system which released some wonderful throaty noise and at least ramped up the feel of a true L-Twin. Everything falls to hand on the Sixty2. It is agile and easy to point and shoots into any gap. It does impart a feeling of urban invincibility. Ducati styling tends to focus on the aesthetics’ surrounding the engine and tank, and for many who would take notice of the frame or brakes. Its quality architecture, with single Brembo’s front and rear that give good feel and power. Not stand on your nose or wipe or wash out the front wheel control and anyway the two-channel Bosch 9.1 ABS is well enough calibrated to deal with any ‘it caught me by surprise’ moments. If you didn’t like anything on the Ducati don’t worry (although I can image, there will be some ex-rich parents coughing into their monthly credit card statements because young Johnnie can just about change anything except the engine. Ok that is a stretch but take a look at the after sales catalogue. Festooned with more goodies that Johnny Dep’s excuses. Fifty plus items including seats, billet this and billet that, mufflers, covers, screens, plates, knives (just checking you are with us) and array of saddle-bags and rear bags. My pick would be the wire-wheels and not moving out of home until I was a grandparent! If my son or daughter (that’s seven short years away) were out shopping for a new motorcycle and we trod the tiles of showrooms I reckon I would be pretty pleased with a detour to a Ducati heaven. There is plenty of choice out there (see the Up Against It breakout) for a city slicker kid and most Dad’s would be thumbing your beards (or mother’s doing whatever Mum’s do) of wisdom citing ‘yes number one, this has ABS and traction control and all the reliability of a IPad and yes it looks nice, but is it a Ducati? Ducati offer something no other brand does and that’s appeasing my Europhilic bent-my first motorcycle after leaving high school was a Ducati Desmo 250-Silver Shotgun. After my ride I can see Ducati had better consider, whether they like it or not, but their new best seller might be the Scrambler Sixty2. That is until we see a Pee-Panigale 659 pop out one day.